This weekend I decided to make Pumpkin Spice Cake. I have never liked pumpkin pie, even though back home in Texas, it is very popular. 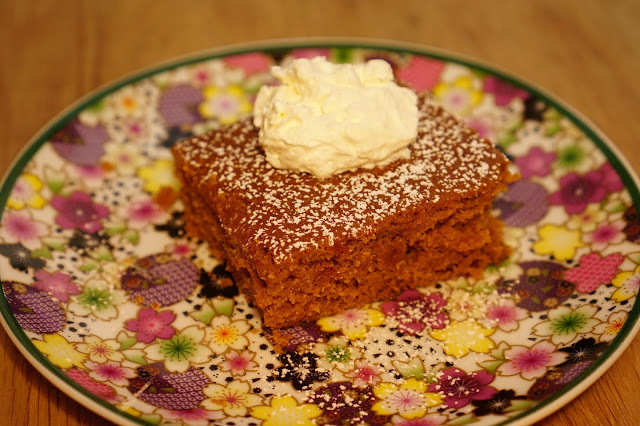 So instead, around Thanksgiving time, I make Pumpkin Spice Cake. 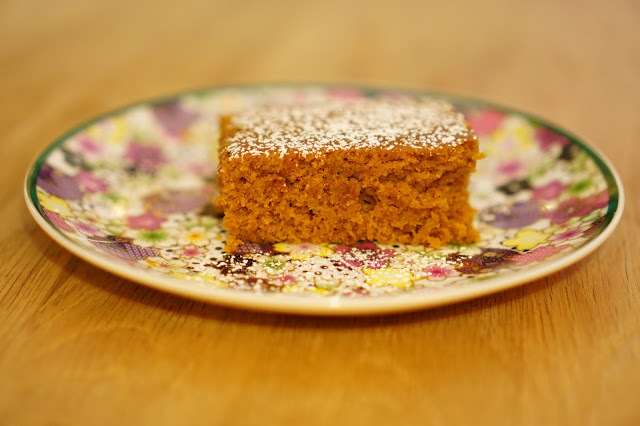 The recipe calls for half a can of pumpkin puree, which makes the cake very moist, and it has a similar flavor to pumpkin pie but tastes sooo much better. :o) If you live in Denmark, you can find pumpkin puree at Meny and Kvickly in the British/American section. The recipe is pretty simple, and makes a large cake. I used a rectangular cake pan, but you could also use two round cake pans. First, set your oven to 176C or 350F, and butter and flour cake pan(s). In a large bowl, beat butter and sugar until light and fluffy with an electric mixer. Then, add eggs, one at a time, and mix well. Next, add the pumpkin puree and vanilla, and beat until incorporated. In a separate bowl, whisk together the flour, baking soda, baking powder, salt, and spices. Then, add the flour mixture and buttermilk, alternately to the pumpkin batter. In three additions, beginning and ending with the flour. Next, if using two round cake pans, divide the batter, and pour into each cake pan. If using a rectangular pan then pour all of the batter in that pan. Bake cake(s) for 25 - 30 minutes or until toothpick inserted comes out clean. Once cooled, dust the cake with powdered sugar or top with your favorite frosting. This recipe recommends using a cream cheese frosting, but I didn't use any.